Better to light a single candle than to, you know, not get to. This blog is one year old! Thanks for reading! It’s a good time to look back and see which posts have made the biggest impact, what my readers’ interests are, and what I’ve learned at the helm. I’ve summarized the past year of blogging in the following figure. Each post is represented by a vertical line. Its position along the x-axis indicates the number of times it has been viewed (scale missing, since absolute numbers aren’t the point here). Along the y-axis, each post has a dot for each of its category tags. Colors represent time of posting in rainbow order, from most recent (red) to earliest (purple). 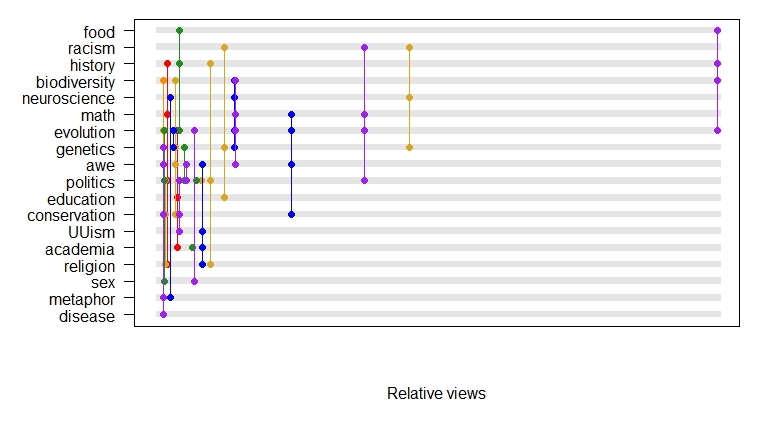 Category tags on the y-axis are ordered by average number of views (top = most views). What to make of it? The most popular category is “food”, although that’s driven almost entirely by my single most viewed post, The Latent Fruits of the Americas. “Racism” has a more reliable record: all three posts on the subject are in the top 25% of all posts. Indeed, my racism posts (here, here, and here) are the ones that have earned the most attention in terms of e-mails, online discussions, and even a few phone calls. It’s a hot topic, after all, and probably the one area where my own training as a population geneticist is most relevant to a sociopolitical issue. Many of you apparently also enjoy “history”, especially as it relates (again) to fruit domestication as well as Russian colonialism. So far, it would be hard to guess that I have a PhD in Zoology. But then you see tags like “biodiversity”, “neuroscience”, “math”, “evolution”, and “genetics”. These more science-y areas are explored in posts like The Cristiani Effect (about survivorship bias), Seeing Ducks (about apophenia), and Permutations and Ur-Mutations (about aliens). And there you have the top eight posts (so far). When I started Adaptive Diversity, I was still in the mindset of the blogosphere of the 00s. I quickly realized my naïveté. In the age of social media, people don’t follow blogs like they used to. Most of my traffic comes from links on Twitter, Reddit, or Facebook. If you happen to see one of these links soon after it’s posted, you may pay me a visit. If not, you’ll likely miss it as something even newer comes down the pike. If a link is lucky enough to get quickly re-shared, it continues to stay visible in a positive feedback loop. As a result, hits are rather haphazard. The correlation between view counts and the actual quality of each post is positive but loose. So, I’d like to mention a few underrated posts. The Absent Transceiver (about hermaphrodites), Practicing Stomach (about disgust), and The Ecology of Research Faculty (about my job) all have had relatively few views, but the folks who have read them have said nice things. Plus I like them. Scientists are basically professional writers, but it’s not good writing. This is partly because it’s written by committee: co-authors, editors, and anonymous reviewers. In any case, the point is to be unambiguous, not lyrical. Adaptive Diversity is a chance for me to try to actually write well. One strategy I use is to keep the Flesch–Kincaid readability score above 50. That means short sentences and small words. This is tricky to do for complex ideas, and I’ve learned a lot in the attempt. I was recently fortunate to see a talk by Ed Yong, one of the best science communicators alive today. He said (paraphrased), “Never underestimate your readers’ intelligence, and never overestimate their knowledge.” Sound advice. I’m particularly proud that my blog has avoided the word “allele”, even though genetics-heavy posts like The Armadillo Gauge and Comfy Kludges are actually all about alleles. I also try not to use the same word too many times in the same post, which is the opposite of how peer-reviewed manuscripts are typically written. The result isn’t exactly Hemingway, but it flows a lot more smoothly than any of my research publications. So what’s next? Based on my stats, I should probably write something about food and racism, maybe with a historical perspective. More seriously, please do suggest topics you’d like to read about. Especially if you want me to flesh out something I’ve mentioned on this blog, on Twitter, in a scientific paper, or in person. Otherwise, you’re in for another year of surprises.